Extented Stay Hotels, Econo Lodge & Rodeway Inn. Cash Back is not available on bookings that are made using Choice Privileges Reward Points, CP Elite Bookings, Choice Net VIP/Preferred Rate, FIT, Preferred Customer Savings, bookings made through a Third Party Wholesale partner (i.e. Group Rates, Employee Discounts, Friends and Family Rates). 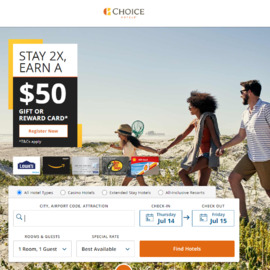 Click Start Shopping to earn 4% Cash Back at Choice Hotels.